As long as there is dependence between software and hardware, one of them becomes useless ahead of time. The solution lies in separating the lifecycles of hardware and software. This offers greater advantages for flexibility and cost savings. A major obstacle for the re-usability of already established solutions is the dependency between software (application) and the underlying hardware. Even if another product range of the same vendor is used, big part of the application needs to be re-programmed. This dependency is a huge constraint for flexibility when seeking the best solution and/or best vendor. nxtControl changes the above-mentioned situation. The nxtControl concept implements a hardware abstraction layer in the control technology. By that the software (application) becomes completely independent from the dedicated hardware and chosen topology. Software and hardware are separated, as has been customary in the IT-world for a long time. The connection to the field level and to the control hardware is done via virtualised hardware. 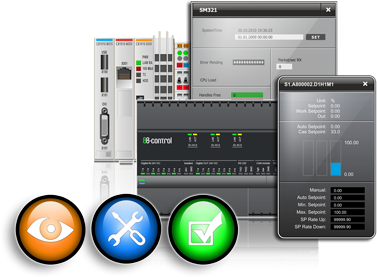 nxtControl provides control hardware as software-objects within the engineering environment. A connection to the field level occurs within the engineering tool. The virtual hardware is perfectly suited for easy testing, simulation, activation and maintenance of plant and equipment. These tasks can be fulfilled on a visualisation device without the need of an engineering tool.